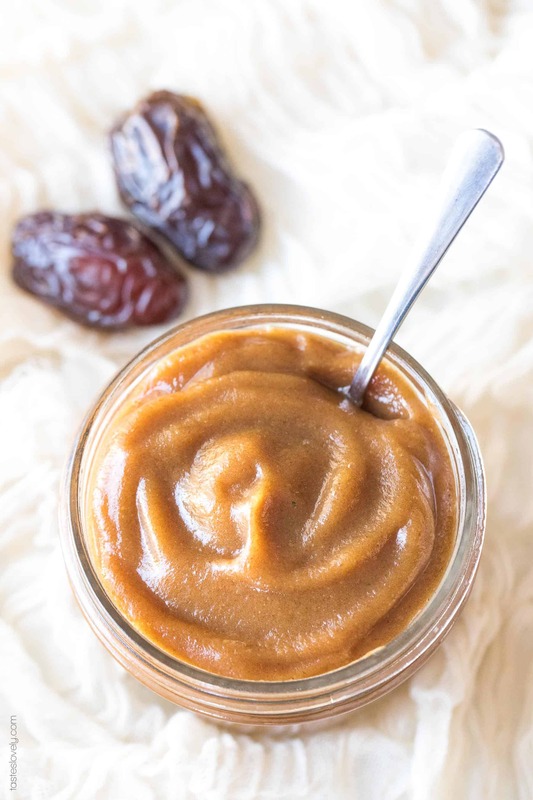 Homemade Date Paste Recipe – An all purpose natural sugar substitute. Use this sweetener in place of any recipe that calls for sugar, syrup or honey! Paleo, whole30 compliant, refined sugar free! 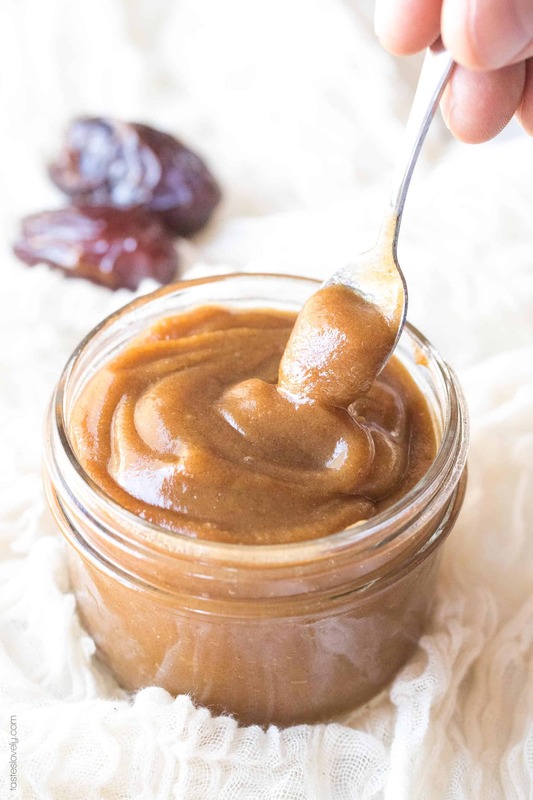 This homemade date paste recipe is SUCH a lifesaver whenever I’m doing Whole30! It is the perfect 1:1 ratio substitute for virtually any sauce, condiment or dressing recipe that requires sugar/honey/maple syrup/agave nectar/coconut sugar. It is the best natural sweetener I have found. I use it in SO many things! To sweeten my coffee (only when I’m not doing a Whole30. If you’re doing a whole30, no sweetened beverages!). In my BBQ sauce. In salad dressings. You name it. Dates are simply wonderful. Natures candy. 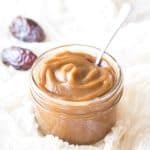 How Do You Make Date Paste? This recipe could not be simpler to make. 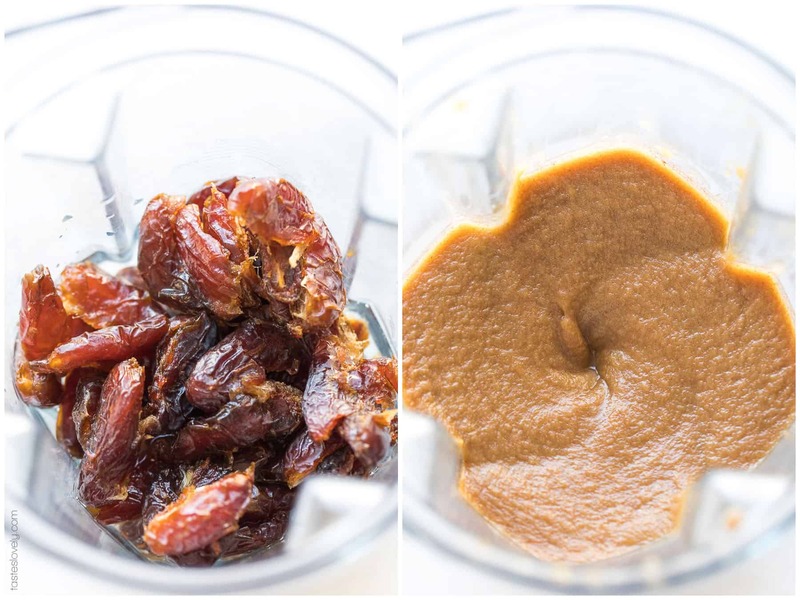 In a blender you combine 1 cup of pitted medjool dates with 3/4 cup of water. I always make my date paste right when I buy a new pack of organic medjool dates from Costco (best deal I’ve found!). If you’re medjool dates are older and/or dried out, those can work too! Just give them a soak in warm water for at least 30 minutes, or up to 1 day. Just keep them soaking until they’re juicy and plump again. This will make it much easier for your blender to break them down and make them into a silky smooth paste. There are date pastes you can buy, but they’re much more expensive. Homemade is always better! 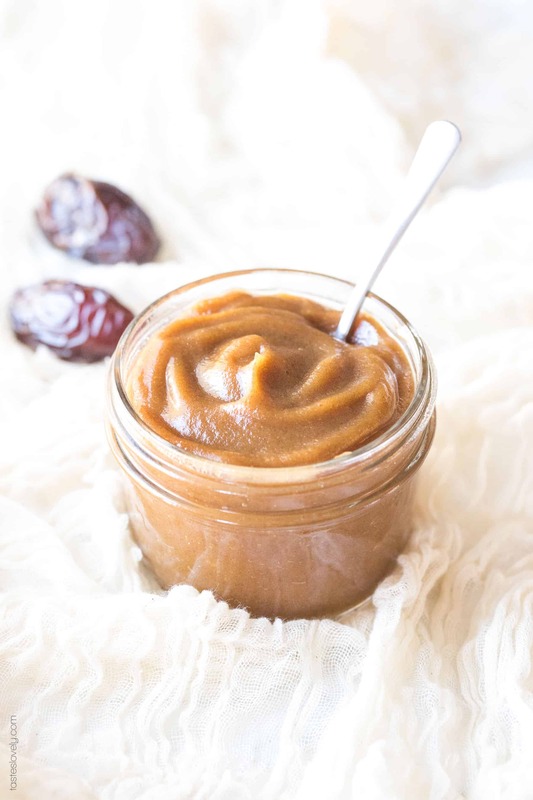 Do I Make Date Paste in a Blender or Food Processor? I prefer to make the date paste in my high speed blender. I find that it makes a much smoother date paste. I’ve made it in my food processor too, and it works, especially if the dates are extra plump and juicy. I use a spatula to scrape it out and not waste a drop. How Long Does Date Paste Last? After making the date paste, I store it in a half pint mason jar. It is the perfect size to store the heaping cup of date paste this recipe makes. If you don’t have a half pint mason jar, any sealed container will do. It will keep in the refrigerator for 3 months. But I doubt it will last you that long. You will go through it much faster than that. Dates are the only sweetener that are Whole30 compliant. So much healthier, packed with nutrients, and delicious. 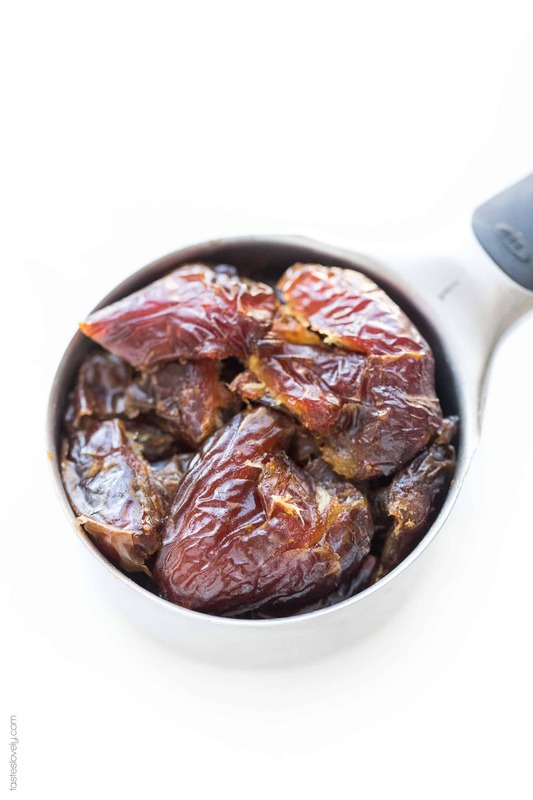 If your dates are very dry, soak them in hot water for at least 30 minutes (or up to 8 hours) to plump them up. If you just opened the carton and they’re still fresh and plump and juicy, no need to soak them. In your high speed blender, combine the soaked dates and water. Blend on high speed for 3-5 minutes, until the dates are completely pureed into a paste, scraping down the sides a few times. Transfer the date paste to a sealed container (I love using half pint mason jars), and store in the fridge. Will keep for 3 months. You can use a food processor instead of a blender, but I prefer my blender because it gets the date paste much smoother. Get new posts delivered straight to your inbox! For free! What ratio of date paste to sugar do you use in a recipe? E.g. if the recipe calls for 100gms sugar how much date paste do you use? Thank you! I am excited to try this for some of my favorite Asian recipes, ie Korean Beef and Firecracker Chicken! 😊 My husband will be ecstatic! Hope you love it! Thanks Alys! I get the medjool dates at Costco too! Were the dates dry? You can soak them in super hot water to really soften them and help them blend super easy. And you can always adjust and add a little more water if it seems it needs it. If they’re sticking to the edge and not getting to the blade they’d definitely need another tablespoon or so of water. Hope you have better luck! What would Be a honey to date paste ratio? Has anyone tried this in coffee?? Yes! I have and it’s so so so so good! Thank you so much Erica! I’m so happy to hear that! Isn’t it great? Makes all the difference. Makes it much easier to wean off refined sugar. Rooting for you and your whole30 journey! 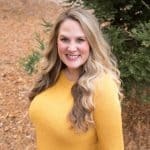 You saved my whole30 diet! Like Erica and April mentioned, not having sugar in tea or coffee has been difficult, but this is a game changer. Happy I found your post! Hi Sarah! I’m so happy to hear it helped you! Way to go on completing your Whole30!